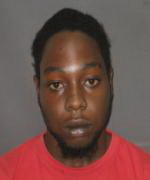 FREDERIKSTED — A 25-year-old St. Croix man was arrested early this morning and charged in the shooting death of two men Easter Monday, according to the Virgin Islands Police Department. On Saturday, May 28, 2016 about 6:14 a.m., officers with the Criminal Investigations and Special Opertions Bureau in collaboration with the Attorney General’s Office executed a search and arrest warrant in the Croixville Apartments located in Grove Place. Noel Boyd of Loraine Village was arrested and charged with 1st Degree Murder in regards to the double homicide that occurred between Morena’s Place and the Harmony Grocery Store in Christiansted. Noel Boyd’s bail was set at one million dollars and unable to post bail, he was remanded to the Golden Grove Correctional Facility pending his Advise of Rights Hearing. Monday, March 29, 2016 at about 5:14 pm, the 911 emergency Call Center received a report of gunfire in the vicinity of the Harmony Grocery Store in the Water Gut area.